Our Confetti Garden™ 'Monterey Beach' Flower Combination is one of those mixed plantings you would probably not have thought to combine, though once you see it, you will know exactly why the designer put these blossoms together. 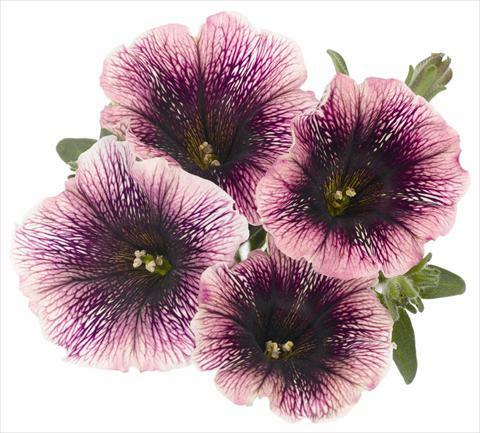 The Empress® Flair Red Verbena and the Bacopa Bahia White Night just seem to draw out every nuance of color in the Petunia Sweetunia® Mystery, arguably one of the most uniquely colored petunias on the market. If you’ve ever been to the beach at Monterrey, you will understand the name. 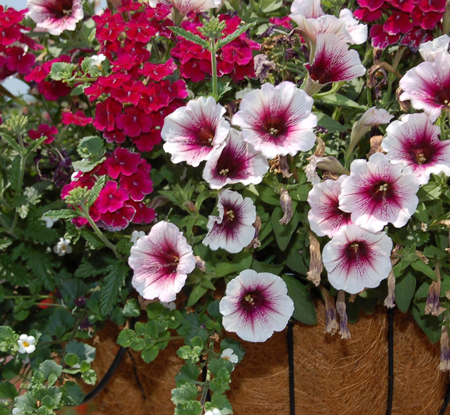 Our 'Monterey Beach' combination will tolerate full sun to light shade (>6 hrs. of sun) and has a mounding, trailing habit, growing 12-20-inches high and wide. Our 'Confetti Garden Monterey Beach' plants are grown and shipped in fine quality growing medium and are guaranteed to arrive alive and ready to thrive. "Monterey Beach....Home, sweet home! :)"
Comment: As a repeat customer, I had no doubts that my plants would arrive healthy and packed impeccably. I was right, and this beautiful combo is thriving and drawing attention with its unusual colors. Very pleased!